Moist red, white and blue marble layer cake with fluffy vanilla buttercream frosting. 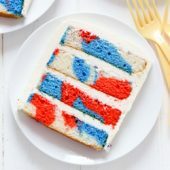 A festive dessert for the 4th of July or any summer party! Preheat oven to 350°F. Line two 8-inch square baking pans with parchment paper, leaving overhang on all four sides of each pan. In the bowl of a stand mixer, with paddle attachment, cream together butter and sugar until light and fluffy. Mix in egg whites, one at a time, followed by vanilla. Mix until well combine. Mix in salt and baking powder. Add half of the flour, mixing until just combined, followed by half of the milk. Repeat with remaining flour and milk. Mix until just combined and no streaks remain. Divide batter equally between three bowls. Tint one bowl of batter with 8 drops super red food gel color. Stir well to incorporate color fully. Tint a second bowl of batter with 8 drops royal blue food gel color. The third bowl remains white. Add small spoonfuls of each color to each prepared baking pan. Scatter colors around. When all batter has been added to the baking pans, using a knife, gently swirl the colors together. Do not over mix. Bake at 350°F for 30-32 minutes or until a toothpick inserted comes out clean. Cool in pan to room temperature. Using the parchment overhang, pull up and outwards to remove cakes from their pans. Carefully remove the parchment paper from each cake. Wrap cakes well with plastic wrap. Chill overnight. If needed, use a serrated knife to remove domes from the top of each cake. Discard or save for another use. Carefully slice each cake in half, creating 4: 8x4-inch cake sections. Return to the fridge until ready to frost. Prepare frosting in the bowl of a stand mixer, using the paddle attachement. Beat together butter and shortening until light and fluffy, followed by vanilla and one cup of powdered sugar at a time. If desired, add 2-3 tablespoons of heavy cream once all of the powdered sugar has been mixed in and is fully incorporated. Place one layer of cake on a cake turn-table or cake stand. Add 3 large cookie scoops worth of frosting to the top. Spread into an even layer. Add a second layer of cake, top off with frosting. Repeat with remaining layers. After adding the last layer of cake, add 3-4 scoops worth of frosting, spreading into a thin and even coat over the entire cake. This will act as your crumb coat. Transfer crumb coated cake to the fridge to chill for at least one hour. Cover remaining frosting with plastic wrap until ready to use. When your cake is ready to frost, remove from the fridge. Add a generous amount of frosting to the top of your cake, working it out and down the sides. Using a small offset spatula and a bench scraper, smooth sides and top of cake. If desired, add a small portion of any remaining frosting to a piping bag fit with a small round tip. Pipe dots along the lower edge of each side. Sprinkle immediately with red, white and blue non-pareils.